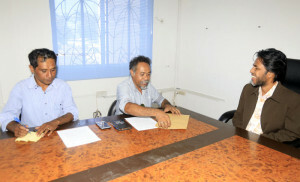 The Secretary of State for Social Communication, Merício Juvenal dos Reis "Akara", met with the Director of the Non-Governmental Organization (NGO) Permaculture of Timor-Lorosa'e (PERMATIL), Ego Lemos, to discuss the Fifth National Perma-Youth Camp, to be held at the Administrative Post of Maubisse, in the Municipality of Ainaro, next November. The meeting was held on September 11, 2018, at the Government Palace in Dili. Mericio "Akara" expressed his satisfaction with PERMATIL's good initiative to organize this camp, which will bring together more than 1,000 young people, not only from Timor-Leste but also from other countries, such as Australia, Indonesia and Argentina. The Secretary of State also stressed that SECOMS will collaborate with PERMATIL in publicizing the event and will take the opportunity to promote with young people the good use of the Internet, especially the use of social networks, in an ethical and positive way, for productive and educational purposes. Before this, four national camps were held, in which young representatives of all municipalities participated: the first in 2008 in Taci-Tolo, Díli; the second in 2011, in Remexio, Aileu; the third in 2012 in Laga, Baucau; and the fourth in 2015 in Laulara, Aileu. PERMATIL Director, Ego Lemos, said that PERMATIL intends to cooperate with SECOMS to improve the dissemination of information, especially among young people, because the majority of the population is under the age of 35 and if young people do not have good preparation they will abandon their villages and sucos to go to cities or abroad. Egos Lemos added that the Perma-Youth 2018 will have activities linked to agriculture, tourism, art and creativity. The Director of Permatil also said that this camp, which runs from November 25 to December 1, also intends to celebrate the National Youth Day and Timor-Leste Independence Day.